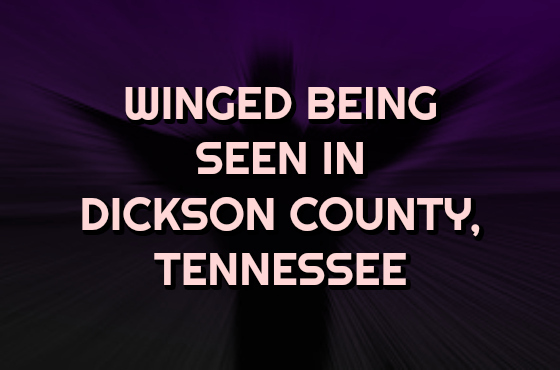 I live in Dickson County, Tennessee. I was star gazing on our back deck. It had to be about 9 pm or so. I live in a very wooded area so I have to pretty much look straight up to see the sky. As I was gazing up here comes this thing flying by exactly where I was looking. It was winged. The wings were folded back towards the rear kind of like delta-winged shaped if you will. It was a dark silhouette against the sky. It flew directly over our home. Pretty much at tree top level. I know it had to be about 6 to 7 foot long and I saw the overall shape of it from head to feet. I did not notice any arms at its side. What I remember the most about it is the wings seemed to be very skinny toward the tips and curved in. I did not really see any membrane. The tips of the wings curved in toward the feet. The head seemed large and it had a large wide protruding mouth. Similar in shape to that of a frog. The thing completely glided over at a very fast rate and I did not hear any sound as it passed by. It was a very quick sighting as it was gone out of my field of view in a matter of seconds. The area in which it flew over me was only probably a 30 to 40 foot span as the trees blocked me from seeing it any further. I do not drink and the only things I smoke are cigarettes. I did not say anything to anyone for a couple of days because since it happened so fast I kind of had to take it in. It did not scare me or leave any kind of bad vibe. There is a video online on YouTube of a couple that went to Italy on vacation and took a little video out of some castle window. In that video of theirs is something that looked very similar in shape to what I saw only their shot of it is at a distance. The video is only 57 seconds long. That thing in the end is very similar in shape to what I witnessed. Here is a link to the video. I found the video and saved it shortly after what I experienced. I am not really sure what it is because it is different than what other reports I have read describe their encounter like but here is something very similar and almost exactly the same shape that these people have captured. I would appreciate any feedback or thoughts.